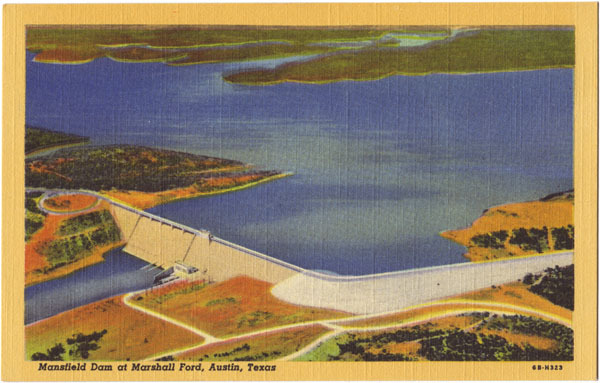 Text on Back: Mansfield Dam at Marshall Ford, 21 miles west of Austin. Largest flood control and hydro-electric dam in Texas. Cost $29,620,000. Completed 1942. Lake is 65 miles long and capable of storing 2,000,000 acre feet of water of which 800,000 acre feet is reserved for flood waters. Generating plant has 100,200 horse power capacity. Owned and operated by the Lower Colorado River Authority. One of the largest recreation centers in Texas.